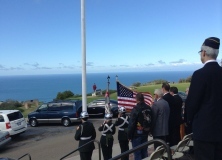 On Veterans Day, at the 11th hour of the 11th day of the 11th month, on the anniversary of the signing of the Armistice ending combat in World War I on November 11, 1918, we Americans, or many of us, remember and honor all those Americans to whom we owe our freedom –- American veterans, those who have served when our country called, the one percent who have kept the ninety-nine percent free. Veterans, that less than one percent whose service has secured and secures today the freedom that the more than ninety-nine percent enjoy, are more often forgotten than remembered, more often ignored, secretly regarded as not quite smart enough to avoid military service, or openly vilified, rather than honored. That is evidenced dramatically in these times when media and government devote enormous time and attention indulgently providing tender loving care to a tiny and self-righteous motley crew of “occupiers” who have never served to defend the nation but narcissistically set themselves up as representing “the 99%.” That ungrateful gaggle, whose acts and antics preoccupy media and government as wondrous to behold, exploit the freedom that veterans have preserved for them by demanding, in an arrogant attitude of ingratitude, special “rights” not accorded to other Americans, and demanding national resources be devoted to such of their priorities as “forgiveness of [their] student loans.” Right. This while thousands risk their lives and limbs defending America in war zones, and tens of thousands of other veterans are in need of full funding for the medical care they need and were promised in serving the nation, not parasitically feeding off it. The media will perforce acknowledge the nation’s veterans on Veterans Day, before returning to indulgently if not breathlessly reporting on those so much like themselves, the “occupiers.” That is, like the “occupiers,” not even “1%” of today’s media darlings have served a day in defense of the nation, and admit in confidential polls that they are in fact liberal “progressives” who voted overwhelmingly for Barack Obama, one of only two American presidents of the modern era who did not deign to serve. The other is, of course William Clinton, Vietnam-era draft dodger who evidenced his regard for veterans as President by discussing military matters with a Congressman by phone while being fellated in the White House by a 21-year-old intern, Monica Lewinsky. Liberal Progressive Noblesse oblige. Notwithstanding, many of the “1%” and the “99%” who the “occupiers” do not in fact represent, will pause at 11-11-11 to honor and remember America’s veterans, all who have served, including specially the more than 1,350,000 Americans who have sacrificed their lives for American freedom in all the wars. World War I, which gave birth to Armistice Day, now Veterans Day, was a most terrible war the horrors of which are difficult to comprehend. The spark which set off WWI was the assassination of Archduke Francis Ferdinand, heir to the crown in Austria, and his wife, on June 28, 1914, in Sarajevo, Bosnia, by a Serbian nationalist. But scholars debate to this date who and what actually caused the war to escalate as it did into a world war, and why, in fact, it was fought. Each side blamed the other. Whatever the answer, a complex web of entangling alliances and mutual defense treaties set off what would become the most horrendous war in the history of the world. An estimated 10-million combatants were killed in that war; an estimated 22-million were wounded. It was a war in which almost 100,000 died from poison gas, use of which has since then been banned as a war crime. It was a war fought on the model of earlier “trench warfare” in which waves of soldiers charged across fields to the enemy in an opposing trench. The difference was that in WWI it was not soldiers with rifles and bayonets in the opposing trench who ran out to fight them, it was a trench armed with machine guns which did no exist in the earlier wars. Troops were slaughtered in those fields by the tens of thousands in single days fighting that WWI, while their generals fought the last war. The United States did not enter the war until 1917. President Woodrow Wilson ran for re-election in 1916 as the Democrat Party candidate in a campaign based on the slogan, “He Kept Us Out Of War.” He was sworn in on March 4, 1917. A month later, Wilson asked Congress to declare war on Germany, which it did on April 6, 1917. The first of some 4-million Americans who would serve in that war began arriving in France in June, 1917. 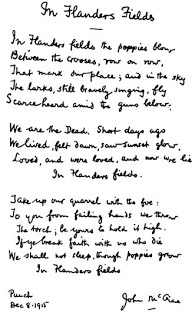 The horror of WWI, side-by-side with the honor of those Americans who served, fought, and died believing, rightly or wrongly, that it was a war “To Make The World Safe For Democracy,” is expressed most profoundly by a poem, “Flanders Fields, written by then-Major John McCrae, MD, a surgeon in the Canadian Army who was born in 1872 and would die in 1918, the year that terrible war ended. 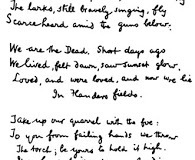 Although “Flanders Fields” was written by a grieving Dr. McCrae in the devastation of the battle of Yres in WWI, days after his best comrade had been killed, his words reach across the more than a century to bring home the reality of all the wars, and of the service and sacrifice of all those Americans who have served when our country has called, believing that the defense of freedom was why they were serving, and was worth dying for if necessary. They kept the faith for us; we must keep the faith with them. May God bless all of them, and may their country honor them, on Veterans Day, and on every day.